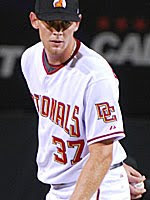 Stephen Strasburg and Drew Storen were drafted in the 1st round by the Washington Nationals last June. We expect both of them to contribute with the big club in Washington later this year, but they have begun the season with the Nationals' double-A affiliate in Harrisburg, PA. Strasburg's amazing performance last night truly emphasizes how remarkable he's been, so far. In 4 games (all starts), Stephen Strasburg has a 3 – 0 record, pitched 17 1/3 innings, and given up only 7 hits. He has given up only 1 earned run (5 total), with 23 strikeouts and 3 walks. The 21-year old ace of the Harrisburg Senators has very unique ERA and WHIP numbers: 0.52 ERA and 0.577 WHIP. I really just needed to write out some of these numbers because they are that spectacular. A couple more… his H/9 is a divine 3.6, and his K/BB ratio is a laughable 7.62. He’ll probably wind up pitching around 45 innings in the minors and 105 in the majors. Let’s hope Jim Riggleman doesn't have him out there on 130-pitch pitch counts, like he did for Kerry Wood in 1998. At least Riggs has said that there is a difference between the importance of winning individual games for the '98 Cubs and these Nationals. The Nationals are not making a run at the pennant. Still, I can't stop worrying about Jim Riggleman's dog-gon' competitiveness. He doesn't like to lose! If Riggs has any doubts about what he should do, or he's becoming concerned with his perception of 'what the fans want', he should have a Tom Trebelhorn inspired firehouse chat with Nationals fans and realize that everyone just wants these guys to stay healthy.